During his marathon three-hour hearing today in the European Parliament, the designated Commissioner for migration and home affairs, Dimitris Avramopolous, repeatedly stated his adherence to liberal principles. He strongly supported the continuation of the Schengen system, a liberal approach to asylum and legal migration, and freedom of movement for EU citizens. What was lacking was further detail on how his principles would be put into practice, and how the different aspects of EU policy in this area fit together. Let’s take legal migration first. The would-be Commissioner supported not only a revision of the existing Blue Card rules on highly-skilled migration, but also a more comprehensive overhaul of EU rules on legal migration. Indeed, he explicitly supported an EU system for legal migration resembling the liberal regimes of Canada and Australia. Yet he did not give a timetable for suggesting reforms in this area, even though the Commission has recently produced a report on the problems with the implementation of the Blue Card system, and the potential reforms of this system can easily be identified. (For an example of what an EU immigration code might look like, see my Statewatch analysis on this issue). He stated repeatedly that he believed that more liberal rules on legal migration would help to solve the problem of migrants’ loss of life en route to the EU, and reduce irregular migration more generally. But it’s hard to believe that Member States would give legal status to all of these would-be migrants. It should be recalled that, in accordance with Article 79(5) TFEU, Member States in any event retain competence to decide on the numbers of economic migrants coming from third countries. As for asylum law, he appeared to believe that the implementation of the second phase of the Common European Asylum System (in July 2015), as well as EU legislation on legal migration, would be sufficient to secure mutual recognition for refugee decisions in the EU. But the existing EU rules only allow refugees and persons with subsidiary protection to move between Member States once they have qualified as long-term residents. To do this, they have to reside legally in a Member State for at least five years, and meet other conditions as well. If they do then move between Member States, their protection status does not in fact travel with them (except if they are moving between the small number of States which have ratified a Council of Europe Convention on this issue). These limited possibilities for persons with international protection to move between Member States do not come anywhere near to satisfying the principles of ‘solidarity, solidarity and solidarity’ which he referred to as regards EU asylum law. Further solidarity could only be assured by redistributing more persons with international protection, as well as asylum-seekers, between Member States. On the latter point, he did at least promise to review the EU’s problematic Dublin system on the responsibility for asylum-seekers. However, as with the last review, it will surely prove difficult to convince richer Member States to change the responsibility rules. 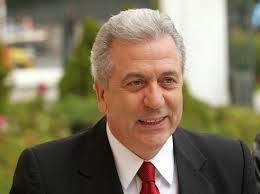 Mr. Avramopolous opposed the notion of a ‘Fortress Europe’, objecting to ‘push-backs’ at the external borders and distancing himself from a fence built at the Greek/Turkish border by a government which he was a minister in. Although he supported a review of the mandate of Frontex, the EU’s border agency, apparently to include search and rescue issues, he did not suggest any concrete measures to supervise Member States’ operational activities at the external borders in the absence of Frontex coordination. He did support the idea of humanitarian visas to ensure that protection-seekers could enter the EU without having to undertake unsafe journeys. But his specific proposal to this end was rather utopian. His idea to appoint staff in EU delegations in third countries to consider asylum applications is attractive in principle, but would be difficult to implement in practice. In order to put the plan into effect, it would be necessary both to reconceive the nature of the EU’s external delegations, and to give EU bodies, rather than the Member States alone, a role in taking decisions concerning visas and asylum in individual cases. The easier course, which could be implemented immediately without such additional legal and political complications, would be to provide explicitly in EU legislation for an obligation for Member States to issue humanitarian visas to asylum-seekers in their external consulates. Arguably, the EU’s current visa code already implicitly contains such an obligation. The negotiations on the current proposal to revise the visa code offer an opportunity to set out this rule explicitly in EU law. Overall, then, the would-be Commissioner cannot be faulted on his commitment to the basic principles which would underlie a liberal immigration policy for the EU. But his understanding of the practical details and the overall coherence of the policy is clearly a work in progress. Arcelor Mittal v Essar. The High Court races ahead in its support for arbitration. On comity, fraud, and worldwide freezing orders.